Some people think notepad had no use in the PC. But it can be used for more works than any other software in windows. 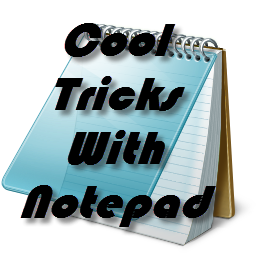 You can make websites, Fake Viruses many other works with a simple notepad… Here I am with some cool tricks that can be done using Notepad. 1. Make your friends believe that your PC responds to you. You can make a program that makes brings with a pop out that can trick your friends to believe you have a computers that responds or chats with you. To do that just open up notepad and Paste below codes in that. You can make changes in the text between quotes. Save it as anyname.vbs. Open it now its looks like a chat box. 2. Making a matrix effect in CMD.As you have seen in the movie sequels of Matrix you can see some numbers scrolling randomly. You can make that using notepad and CMD. Open Notepad and Paste down the below code in it. Save it as matrix.bat. Open it and now you can see matrix effect. Some Fake Virus Tricks With Notepad 🙂5. CD/DVD drive pop up Virus!!6. Virus that makes you to loose control of Keyboard.7. Fake Virus Program for Testing Anti-Virus Efficiency.